One of the most common methods of data collection in second language research is using questionnaires of various kinds. In spite of the wide application of questionnaires in the second language field, there does not seem to be sufficient awareness in the profession about the theory of questionnaire design and processing. The usual--and in most cases false--perception is that anybody with a bit of common sense can design good questionnaires, and the practice of questionnaire design and use has remained largely uninformed by theory. As a consequence, it is all too common to see that studies which start out with exciting research questions are spoiled by the application of badly designed questionnaires and/or a lack of reliable and valid results due to faulty processing. One reason for the lack of sufficient awareness of questionnaire theory among language researchers is the absence of relevant summaries and training materials in the second language literature. The purpose of the current book is to fill this gap. The book is motivated by very practical purposes, namely to help researchers to increase the efficiency of their questionnaires and to avoid possible pitfalls. Accordingly, special care has been taken to avoid unnecesary jargon, to make the text accessible, and to relate everything to real-life situations. Illustrated by concrete examples, the book offers a thorough but accessible overview of the theory of questionnaire design, and administration and processing, with a special view on second language research applications. The conclusion summarizes the main points of questionnaire theory in a straightforward checklist that offers an easy-to-use tool for researchers. 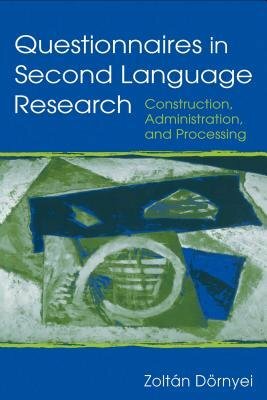 Researchers and students in TESOL and second-language programs and applied linguistics, with secondary markets in other language research (e.g., child language) will find this book useful.